How can you begin rebuilding your life when the sudden loss of someone you love shatters the happiness and contentment you have created together? This is the dilemma author Ruthann Reim McCaffree faced when her husband Terry fell from a ladder and died, suddenly, at the age of 61. One moment, they were a happily married couple of 40 years facing a normal, hectic, work day. The next moment, Ruthann found herself faced with the task of making arrangements for her husband's memorial service, all while dealing with intense feelings of sorrow and despair. As a means of coping with the aftermath of losing Terry, Ruthann began keeping a record of the events following his death. This journal became Suddenly Single, A Guide to Rediscovering Life After Tragic Loss, where Ruthann shares her personal journey following the devastating shock of losing her life partner. Ruthann has shaped this into a touching memoir and tribute, which also serves as an inspirational guide to help those who are experiencing a similar loss in their own lives. Provided within the context of Ruthann's story are her "Ten Survival Steps," serving as a thoughtful framework to help others work through many of the overwhelming aspects of grief. She offers tips for answering the most basic of questions ("How are you? "), as well as how to learn to laugh again. All of this comes with one goal in mind: helping others restructure their lives after losing a loved one. Woven through a narrative that is both candid and poignant, Suddenly Single is a life-affirming gift for those who are ready to embrace the first hopeful steps of healing and recovery from the pain of loss. Invite Ruthann to speak to your class or group about her book. 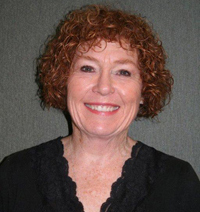 She is an exceptionally warm and sensitive speaker with the gift of talking about grief and loss with tenderness and honesty and leaving participants hopeful and inspired. Call her to arrange for her to be on your calendar. This book is such a gem, I can’t recommend it enough! It is so much more than the story of one woman’s heartbreaking loss. It is the portrait of a courageous, wise and irrepressible spirit that has charted the path from the deep pit of despair back to solid ground. Her tale is engaging and honest, told with a poignant and genuinely moving authenticity. Her storytelling will make you cry and laugh and capture your heart. McCaffree is not afraid to take her readers with her down an incredibly personal road, and while the path is often painful, he words always firmly facing toward hope and light. The insights and revelations that she shares are not only moving, they are profoundly inspirational. McCaffree candidly describes the moment that she “chose life”, that in the midst of the most severe body-blow to her life she consciously decided that there is still happiness and joy to be found in this world. In that moment she reveals the buoyancy of her spirit that is the true gold of her book. Any reader who has suffered such a grievous loss will be wrestling with the painful question of whether life will ever get better, of whether the pain will ever end. McCaffree takes your hand and tells you that it will be OK, that she was able to walk through the fire and survive, and that you will be able too. This is just such a message and story that those in the midst of deep grief are hungering for, yet her storyapplies to grief of all shades. Loss is an inescapable part of the human experience, we are all grieving to greater or lesser degrees for all sorts of things. Most anyone will find some nuggets of wisdom to apply to their lives. Her book is ultimately a bold and powerful affirmation that life, even in its darkest and most difficult moments, is always an adventure worth living. Highly recommended!! Overnight, I became a widow of a healthy, thriving man who'd just turned 60 and had the world, including me, by the tail. We had so much planned. A tragic bicycle accident. I was given this book, as a gift. It became by bible. I cried through boxes of Kleenex, laughed until it hurt and studied the questions. I couldn't put it down. It read like a novel. I wanted to see how it ended. I wanted to know that Ruthann was going to be OK. That meant I would too. There's no "how to" manual for losing someone, especially when it's unexpected like it was for Ruthann, like it was for me. But this is the closest thing to it. After a year and 1/2 it still sits quietly on my nightstand, ready to give me hope any time I need it. I refer to it regularly. If you or someone you know lost a loved one suddenly, love them enough to give them this gift of peace. I bought 10. Already used 2. A sign of my age, I guess. Thank goodness I believe there are good things ahead for me, like another chapter from this book tonight. Suddenly Single a guide for rediscovering life after a tragic loss...RuthAnn Reim McCaffree. I can't stop crying, laughing and learning from this book. It has been 33 years since my mom committed suicide and the 10 steps she outlines in the book have only taken me 33 years to complete. Don't wait as long as I have-get the book! It applies to any loss! Peggy Rose Webster. At a recent conference, I discovered a remarkable book that is bold and brilliant - Suddenly Single: A Guide for Rediscovering Life after Tragic Loss. The title actually understates the breadth of this story. I quickly discovered hidden within the pages of this small book, a priceless gift - a roadmap to self-discovery and a ten-step survival guide for many of the hurdles that everyday life throws our way. 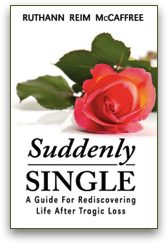 Suddenly Single is a wonderful resource to help people forge a meaningful life, all through countless examples, self-reflecting questions, thoughtful tips, and Ruthann McCaffree's electrifying story of loss and rebirth following the sudden and tragic death of her husband. Probably what makes this story work so well is McCaffree's raw courage, her honesty, her background as a counselor and life coach, and her willingness to normalize and share every ounce of emotion and feeling that she struggled with until she conquered years of sadness and grief. Suddenly Single is a power and uplifting story. You will feel the pain and joy McCaffree experienced as you are drawn into her world. You will leave it in celebration. In the end, you will possess the tools to self-nurture your life and to help overcome the challenging obstacles that can often be emotionally draining. It is up to you, though, to use them and to discover your life's path. Don't miss this book. If you know anyone trying to find their unique path toward a rich and fulfilling life - and that's most people - then I highly recommend gifting it to them. Donate it to your local library and gift it to yourself!